Table of distances between Heysen Trail locations such as huts, campsites and towns. This feature and its underlying data is under development and as such should be considered a BETA version – it should be read in conjunction with the official Guidebooks. View notes at the bottom of the page about how these distances are calculated. The CSV file can be downloaded and opened in Microsoft Excel or a spreadsheet program. This feature and its underlying data is under development. As such it should be read in conjunction with the official Guidebooks. This data originates from our GPS data of the Heysen Trail, version 7/7/2016 v3.14. and was updated on 21/6/2018 to fix some minor inaccuracies, particularly in Section 1 (in total 1.22km was added to the overall 1,102km length). This data is redacted from an official survey undertaken in 2000. It has been maintained and updated to include all current re-routes. It does not account for temporary re-routes. The original data file contained over 247,000 latitude and longitude points. This has been redacted to show only every tenth latitude and longitude point – this was required to allow for the file to manageable for web display, and for display and processing on a handheld GPS units. Many units would be detrimentally affected by processing and displaying such a large GPX file. Many units, especially older units, are unable to display more than 10,000 points per track. Due to the detail of the original survey this redaction has minimal impact on the display of distances, both on-screen and in the field. Due to the technology at the time the survey was undertaken this data did not include elevation data. Re-routes often include elevation data. Distances from the start or end of chapter or trailhead are measured on the main trail, and do not include alternate routes or spur trails. Spur trails add an additional 17.5km (one-way) to the overall trail length, and alternate routes add an additional 42km to the overall trail length. Temporary re-routes are not factored in. Trail distances remain along the original permanent route. If a temporary re-route eventually becomes permanent the distances will be adjusted. 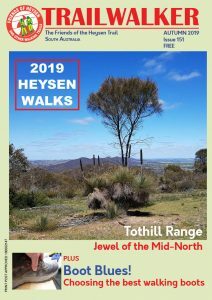 Errors do not accumulate, by which we mean that if a campsite is misplaced on the trail it does not impact on the the stated overall chapter trail length or the stated overall length of the Heysen Trail. Displayed distances are rounded to two decimal places. On the webpage table above, rounding omissions do not accumulate. In the CSV file rounding in the segment field accumulates to an error factor of about 7km over the 1,100km+ trail. When hiking in the field actual trail distances measured on a handheld GPS unit are very unlikely to exactly match the figures in the above table. Walkers rarely remain true and straight on the trail at all times. Resting for breaks, entering buildings and making short trips off the trail will increase the reported distance travelled. If a device’s coverage reduces during a break or entering a building accurate coverage may reduce and the unit may mis-report data recorded during this time, possibly adding a several hundred metres to the reported distance. In most cases a handheld GPS unit will report a slightly higher figure – a figure of +- 500m in every 10km would be reasonable. When a location is off of the main trail (it may be on a spur or alternative route part of the trail), the off-trail section is not included in the trail distances. For instance, Hawker is 6.6km off the mail trail on an alternative route. Walking from Mt Elm Camp Site to Hawker is the segment of 3.24km (to the point where you leave the main trail for Hawker) + 6.6km = 9.84km.